The New York Knicks freed up north of $70 million in salary commitments by dealing star forward Kristaps Porzingis and cap fillers to the Dallas Mavericks prior to the trade deadline. This trade comes after Porzingis himself had requested to move on from the long-downtrodden organization. It also some with the Latvian set to become a restricted free agent during the summer. This forced the Knicks and team president Steve Mills into making a deal that certainly doesn’t seem to be in line with what Porzingis could have netted the Knicks if they waited a bit. All the while, talk of the likes of Kevin Durant and others heading to New York this coming summer will blow up over the next few months. Sorry Knicks fans, it’s not happening. Kevin Durant was always a long shot: KD might test free agency, but it’s clear he’s not going to sign with the Knicks. Durant has made it clear that money will be a big determining factor in his decision. Golden State can offer more cash than any other team to retain the two-time reigning NBA Finals MVP. Sure New York is North American’s largest media market. That will give Durant a ton of earnings potential off the court. But he’s in love with Silicon Valley in the Bay Area — something that has proven to be financially fruitful for the star. In addition to this, Golden State is moving into a waterfront arena in San Francisco next season. Even more than Oakland, San Francisco offers Durant untapped earning potential. The Knicks are still a laughingstock: Trading Porzingis isn’t going to help land a star. 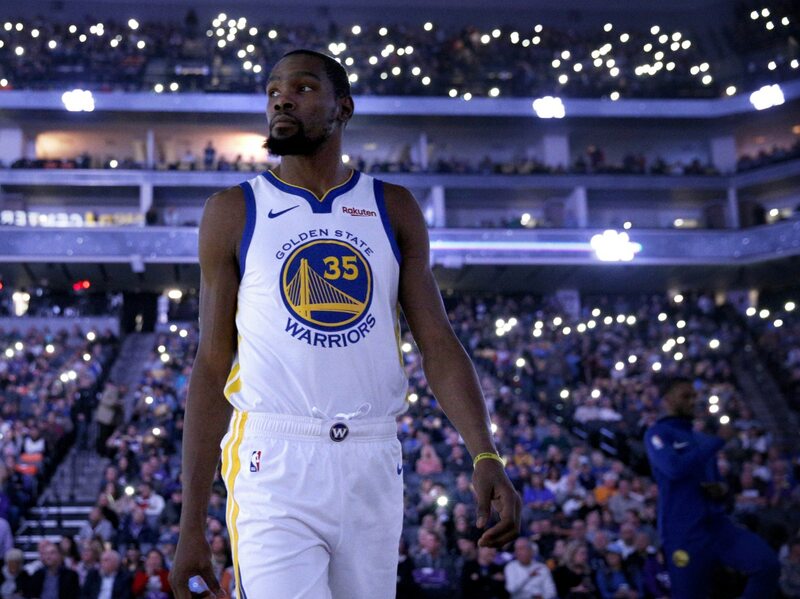 The allure of Rucker Park and Madison Square Garden is not enough for stars like Kevin Durant. He’s made this much clear in the past. The Knicks need to show themselves to be a stable organization. That has not happened as of yet. Charlie Ward as the last Knicks draft pick to sign a second contract with the team. He played with Patrick Ewing and Charles Oakley. Think about that for a second. The Stephen Curry dilemma: Curry has proven to be a downright boon for Durant’s career. Why in the world would Durant leave behind a generational point guard for the unknown that New York City might bring? Remember Durant and LeBron James are good friends. If there’s some thought in New York City given to teaming KD up with impending free agent Kyrie Irving, that relationship might play a role in Durant’s decision-making process. It’s simple. Durant and Curry represent the best one-two-punch in the NBA of this generation. Leaving behind Curry after potentially winning a third consecutive title makes no sense. Sure it’s fun to think about the stars aligning in the Big Apple. The NBA is a much better product when the major markets are relevant. Unfortunately, the Knicks have not been relevant for the past two decades. The idea of somehow attracting someone of Kevin Durant’s ilk by moving one of the game’s best young players makes no sense. It’s another reason why these Knicks will be relegated to second-class status no matter who is running the ship. Until New York proves it has a solid front office, this is not going to change. Period.